PKS Media / Getty Images. 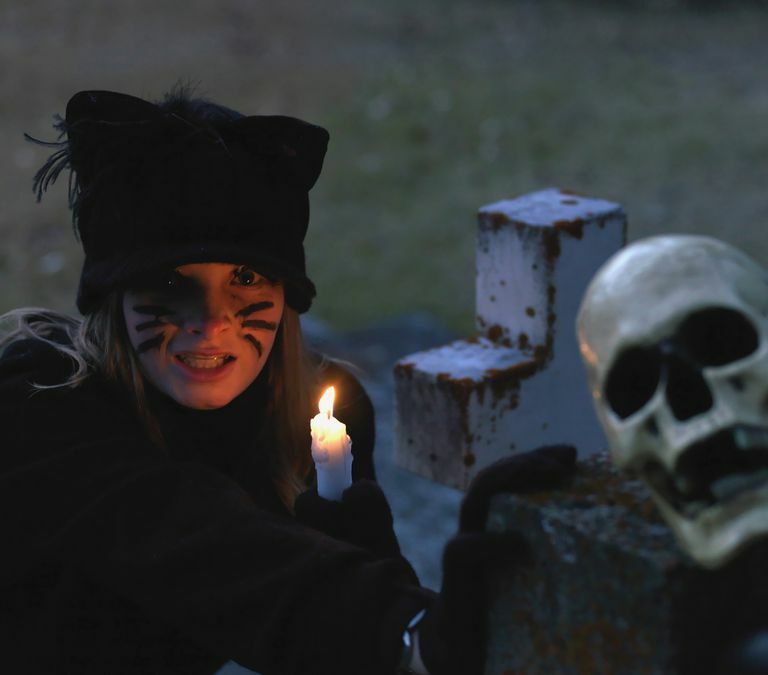 What's the real history of Halloween and Samhain? Though some things remain mysterious, we find in what's known themes of honoring our ancestors and rituals protecting against the dark arts. Samhain is a threshold time, when the Sun begins to wane mirroring the rhythm of the Dark Moon. It's celebrated on October 31st, with the Sun in soulful, primordial Scorpio. One of the most profound times in the solar year is Lunar Samhain, when Sun and Moon are both in Scorpio at the New Moon. In 2016, this falls on October 30th. This ancient seasonal celebration has Celtic and Nordic roots across Europe as a time to acknowledge the beginning and end of all things. It may come as a surprise that what we call Halloween today has roots to the earliest Christians in Europe who wanted rites to remember their Catholic martyrs and assist them in purgatory. The two seasonal rites converged with the Catholic Irish and the celebration took on a life of its own as a popular holiday in the 19th century. The Irish brought their folkways to England, then to America, where the pumpkin replaced the turnip as the jack-o'-lantern. The spirit of the season lives on in the guisers, mummers, and maskers—all archaic names for costume-wearers. This traces to a folk belief that the supernatural was close at hand, with boundaries precariously thin. The folkways and Christian prayers for the dead are a response to a heightened sense of danger and a fear of what lurks in the shadows. It's true that the traditions of Halloween and the Celtic feast of Samhain were originally shaped by different theologies—one Christian, the other from the indigenous folkways. In both, we find expressions that are in natural sync with the dying season. In this quest to know the real history of Samhain and Halloween, turn to Ronald Hutton and his book The Stations of the Sun, A History of the Ritual Year in Britain. In the book, Hutton quotes from a leaflet by the British Pagan Federation for Hallowe'en 1994, to defend against attacks on the celebration. "For the Celts, Samhain was a time when the gates bewteen this world and the next were open. It was a time of communion with the spirits of the dead, who, like the wild autumnal winds, were free to roam the earth. At Samhain, the Celts called upon their ancestors, who might bring warnings and guidance to help in the year ahead." The leaflet repeats a commonly held belief among those of us that have more resonance with the older traditions of Europe. And that's the oft-told story that All Saint's Day or All Soul's Day absorbed the pagan deities, and held a feast in sync with the ancient tradition of Samhain. Hutton argues that while this may be partly true, evidence remains "intractable and ambivalent." In early medieval Ireland, Samhain, often held on November 1st, simply marked the beginning of Winter. "In Tochmarc Emire (Irish mythology from 10th c) it is the first of the four quarter days mentioned by the heroine Emer: "Samhain, when the Summer goes to rest." It was the opposite of Beltane (May 1st) with the gathering of livestock and the harvest done. A time for the tribes to gather together for great feasts, "and indeed," writes Hutton, 'the feis of Samhain,' at which local kings gathered their people is a favorite setting for early Irish tales." While Hutton concludes there is no evidence for a Pan-Celtic celebration in medieval records, he tells of many localized traditions, mostly in Ireland, the Scottish highlands, and Wales. An 18th-century travel writer in the Scottish highlands saw a man light a broom and run through the village with a great crowd, who then all created a great bonfire or hallowmass fire. Along with fire rites, Samhain is a time for divination, with "When will I die?" being the primary query. The same writer mentioned above noted that families in Wales would mark pebbles, and put them in the fire, and then sort through the ashes the next day. "If any stone was missing in the morning, then the person whom it represented would die within the year." Though Hutton sees sparse real evidence of Samhain rituals, he does acknowledge Nut Crack Night, the casting of nuts to divine that happened all over Britain. In keeping with the mood of Scorpio season, Hutton says most questions were about the timing of death, "an enterprise at once suited to the opening of the most lethal of seasons and to a date associated with those already dead." I was intrigued to learn about the Christian origins of the Halloween itself. Holding bonfires for the martyred dead of the faith date back to the 4th century, and by 998, there were solemn masses held for the souls of the Christian dead. They are merged today in the minds of most, but Hallowe'en actually has its name-roots in the Catholic observance of All Hallow's Eve. The Halloween of today with its horror masks and trick-or-treating has little in common with the somber rites dating to the first century in Britain. Back then, the main event was a mass for the souls in purgatory, and then the ringing of the church bells on their behalf. Tracing history, you can see the Catholic rites of purgatory being dropped, then restored, with the Tudors as they went back and forth with young Edward (Protestant), then Mary (Catholic). The bell ringing and rites were dropped at the Elizabethan Reformation but added to the Book of Common Prayer in 1928 as All Soul's Day. One sweet custom for both Protestant and Catholics into the 19th c. was souling or soul-caking, when children would "go 'round and expect soul cakes or collect the ingredients for it." A rhyme goes, "A soule-cake, a soule-cake, Have mercy on all Christen soules for a soule-cake." In quotes like this, I can't help but think of the demonization of the wise women of the ancient indigenous traditions of Europe. Hutton writes, "At Hallowe'en 1874 Queen Victoria herself paid tribute to the traditions of the region by having an 'immense' bonfire made in front of Balmoral Castle upon which the effigy of a witch was burned after being escorded thither by people costumed as fairies." This is one of those contradictions, with native deities becoming demons, and the forest, once the sanctuary, turning into a feared, wild and dangerous place. The real history of Halloween and Samhain is tangled, with overlap and mutual reinforcement. Both rituals are expressions of the season—a time to call out to ancestors and guiding spirits and, if necessary, to shore up your defenses with protective fires. For many, Halloween is a secular holiday to dress up and go trick-or-treating. But it's also a time of great mystery and even magic, when we may touch something eternal, even as we sense its many guises. What is the Deeper Meaning of the Winter Solstice?